I had no idea they sell the same stuff at Walmart. My wife also drinks the GT brand, I think the Trilogy is her fav. I've been getting it at the co-op. For my late breakfast, I fixed fried plantain (banana), refried chunks of tender beaf, and a scoop of the boiled quinoa that I'd made last night,...the meat and fried banana were lightly salted with pink himalayan salt. It was delicious. PLUS, I finished off that bottle of cold sweet strawberry kombucha with breakfast. It really 'hit the spot'. The strawberry and fried plantain complemented each other. Today, I'm beginning to have the same results! Yay, kombucha! The result is much more reliable than prune juice or prunes. I'm making my first attempt at creating a kombucha 'baby' today. Of all my teas, I'm being forced to use my beautiful Arabian green tea. 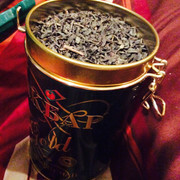 No teas with any oils can be used. (An hour later...) Okay, so I've complerted my attempt at making a kombucha scoby, using my own tea, sugar, and half a bottle of gingerade kombucha that I bought at the grocery store. My masterpiece is now sitting, covered, on a table in the kitchen. In five days, if all goes well, I should have a scoby floating on top of the tea. "Scoby" is actually an acronym: Symbiotic Culture Of Bacteria and Yeast. And that's exactly what it is! A scoby is the living home for the bacteria and yeast that transform sweet tea into tangy, fizzy kombucha — think of the scoby as the coral reef of the bacteria and yeast world. May 8, 2017"
I really, really, should have looked up a recipe before making my kombucha today, but I didn't. I put considerably more tea in my mixture than is popularly recommended. This site gives some proportions for different size batches. However, I didn't use this recipe. I used to make kombucha 'all the time', so I got cocky. I don't think any of you have complained lately of having foot-and-mouth disease. So far, so good. But if you are wringing your hands, worring that you'll be the next 'hand foot and mouth disease' victim, I have good news for you. Yes, kombucha to the rescue! It can prevent it. Braz J Microbiol. 2015 Oct-Dec; 46(4): 1245–1255. All the content of the journal, except where otherwise noted, is licensed under a Creative Commons License CC-BY. The foot and mouth disease virus (FMDV) is sensitive to acids and can be inactivated by exposure to low pH conditions. Spraying animals at risk of infection with suspensions of acid-forming microorganisms has been identified as a potential strategy for preventing FMD. Kombucha is one of the most strongly acid-forming symbiotic probiotics and could thus be an effective agent with which to implement this strategy. Moreover, certain Chinese herbal extracts are known to have broad-spectrum antiviral effects. Chinese herbal kombucha can be prepared by fermenting Chinese herbal extracts with a kombucha culture. Previous studies demonstrated that Chinese herbal kombucha prepared in this way efficiently inhibits FMDV replication in vitro. To assess the inhibitory effects of Chinese herbal kombucha against FMDV in vitro, swine challenged by intramuscular injection with 1000 SID50 of swine FMDV serotype O strain O/China/99 after treatment with Chinese herbal kombucha were partially protected against infection, as demonstrated by a lack of clinical symptoms and qRT-PCR analysis. In a large scale field trial, spraying cattle in an FMD outbreak zone with kombucha protected against infection. Chinese herbal kombucha may be a useful probiotic agent for managing FMD outbreaks." Thanks for sharing your results, vintage! Now that I'm cleaned out things have slowed down but are still moving through regularly, so hopefully I wont ever get that blocked up again. The constant bloated, uncomfortable feeling is gone and I don't suffer after meals the way I did before. My brew already has a baby scoby on top, so I must have done things correctly. My husband says it looks like I have a placenta growing on the counter. It really is gross looking. When i lived in Guatemala my landlady turned me on to this. The recommended recipe was only only part of a block of raw, unrefined can sugar and water. I forget the name but the sugar is a dark tan color. I doubt one can find it here. The scobies were shared with neighbors when the reproduced, about weekly. It was a much more effective drink that what I buy here in stores. I'm seeing a tiny thin line forming at the top edge of my attempt at a brew which I started on August 5th (above). Today, I'll drink the last swig of the store-bought kombucha gingerade from the refridgerator. After that, I'll uncover my experimental kombucha and taste it to see what I've got. Cornfedup, could you give me the name of the site where you ordered your scoby? I'll need it in case my current attempt fails. A scoby does seem to be forming. They aren't pretty. Here's a photo of mine. Could you post a photo of yours, please, Cornfedup? Is the princip same as Apple Cider Vinegar ? hm. ok: carpe diem ! I'm thinking that they do have a common element, goisgo. They do sound similar, but I've been putting ACV with "the mother" in my water daily for years and have never had anywhere near the same results. Yes, the kombucha results are wonderful. It's the best I've been since my accident, three and a half years ago. On the other hand, my ACV has mostly been ignored,...making me feel a little guilty for abandoning it. Here's an article on the similarities and differences between kombucha and apple cider vinegar. I'll post just the last part of the article here. This is one of the best vinegars for health. Of all the vinegars, it’s probably the most similar to Kombucha in terms of how it’s made and what’s inside of it. You can think of Apple Cider Vinegar as an Apple, and Kombucha as an Orange — they are similar yet different. And while the benefits are similar and may intersect, there are enough significant differences that one does NOT necessary replace the other in your diet. Some people may not react well to Kombucha, but may be more tolerant of Apple Cider Vinegar. Both kombucha and natural vinegars contains health promoting elements and can be used as general health tonics. The usual method of using vinegar (such as ACV) as a health drink is to dilute it with water." I harvested my homemade kombucha today, and it tasted amazing. Really delicious. Fruity and just the right touch of vinegar. There was nothing 'iffy' about it. I started it on August 5th, and today is the 11th, so it grew for six days. I saved the scoby (baby mushroom) and will pass it to a new brew of sweetened tea. After I bottled the two cups of homemade kombucha, there was a half-cup left over, and that's what I drank and am reporting on. I put the new bottle of the delicious liquid in the refridgerator, and I look forward to drinking it tomorrow. I found a recipe for homebrew kombucha. It says to add some 'already brewed' kombucha to the new batch, so that's what I'll do this time. "When making a new batch of kombucha, follow the same procedure, but add the scoby and at least 1/2 cup of prepared kombucha to the tea in place of the starter." Walmart appears to have GT gingerade kombucha, so I'll soon be 'in business'! I'm going to try to get a 'starter' from the bottle of kombucha and drink the rest. From my experience in the past, it's easy to overproduce the kombucha tea. 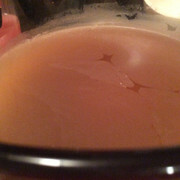 The kombucha gets really happy with all the attention (sugar, strong brewed tea, pure water without fluoride, right temperature), and, at least in South America, at an altitude of over 9000 feet,...well, it went hog wild and produced far more than I could drink. I'll probably have to learn how to put mine 'on a diet', so that I don't waste tea and other resources, while keeping my kombucha happy. vintage, what were you doing in South America at over 9000 feet? Or did I miss something? Probably did, but it is you, Vintage, so I'm just never sure. And by the way, I love the Ginger GT kombucha, but can only take in small, small doses. Yes, Jaylock. I lived almost 20 years in south america. Spanish is my second language, but I will always have an American accent when I speak it,...especially when I'm tired. And it was in south america that I became aware of the usefulness of several herbs.